We review the unique worker placement game Argent: The Consortium. In this euro game, players are trying to gather the most votes from the hidden voters of the university. 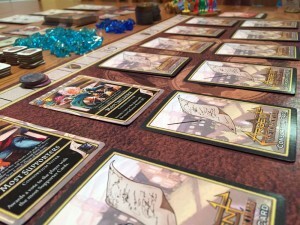 When I heard that one of my favorite game publishers, Level 99 Games, was creating a worker placement game that is set in the fantasy universe of The World of Indines (BattleCON, Pixel Tactics) and pitted competing schools of magic against each other to be elected as Chancellor of Argent University, I was immediately interested in the game. That game is Argent: The Consortium. Argent: The Consortium is a worker placement game for two to five players that plays between 30 and 45 minutes per player. The object of the game is to lead one of six candidates to win the most votes from the Consortium Voters and be elected the Chancellor of Argent University. There is one Neutral candidate and one from each of the five schools of magic in the game – Planar, Divinity, Mysticism, Natural and Sorcery. The game consists of five rounds of variable length. After the end of the fifth round the votes are tabulated, and whoever receives the most votes is the winner. Players can gain multiple types of cards during the game to give them special abilities. The game comes with many components, which I love, but, because our society is so negative, let’s start with the bad first. To begin with, this game is a SPACE HOG. 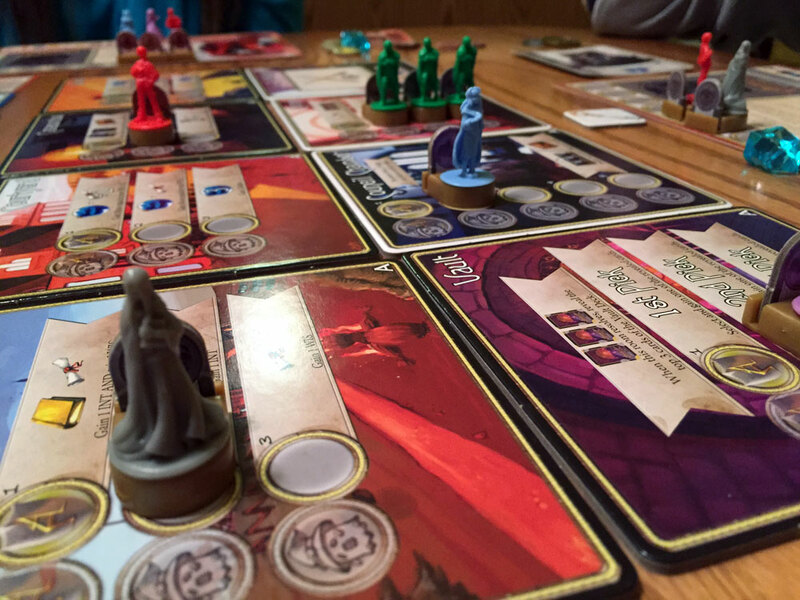 The following is set up at the start of the game: the Consortium Board, the University board, five rows of cards, The Bell Tower, and Mage power cards. Then there are three types of cards that can be drawn, from the top of the deck, or drafted from those that are available face up: Spells, Vault Cards, and supporters. Finally, each player also gets a Candidate Sheet with that candidate’s starting spell. As you can see, this will take up a lot of table space. If your table is the size of the Lannister’s small council table, you should be fine; otherwise, be warned that it may be difficult to fit a three or four player game on a small card table. My only other complaint, and it is MINOR, concerns the Mage Pawns. In the game, a Candidate’s school of magic only determines its first two of a possible seven mages that can belong to that school. Because every school can employ mages from other schools, Loyalty Badges that match the Candidate’s Department Icon are inserted into a slot in the back of the Mage Pawn. These badges are a bit fiddly and it is difficult to differentiate between a few of the colors. One minor complaint is how fiddly the player marker tokens are. Otherwise, these components are great. The University room tiles are made of nice, thick cardboard. The Mage pawns are colorful and the school they belong to is easily identifiable. The plastic Mana tokens are beautiful. The card stock is standard. Not amazing, but also not cheap. Also worth mentioning is the Iconography used in the game. It is great. It is easily identifiable and consistent. Once you learn what an icon means, it is clear. This is NOT Race for the Galaxy, where it will take you five games to finally grasp all of the icons. Finally, I absolutely LOVE the art in this game. The Candidate Sheets, the cards… heck, the University tiles. They are all gorgeous. Only some of the Vault cards were a little pedestrian; otherwise, the art is amazing. That being said, if you do not like anime, you may not like the art in Argent. Due to the complexity of the game, I am only going to provide a very high level summary of the game. Feel free to visit Level 99 Games for a pdf of the official rules. Each round is played out over 3 different phases, for a total of five rounds. After the end of the fifth round, the votes are tallied and the winner is determined. 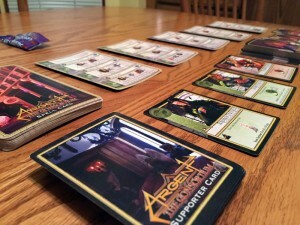 The worker placement aspect of Argent: The Consortium is absolutely fantastic. I loved this game (you MAY see this again later in my review…). Trying to figure out the requirement for each of the twelve Consortium Voters is the crux of the game, and it is what makes this game so unique. 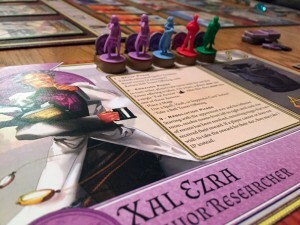 At the start of the game, the two Voters that require the most Supporters and the most Influence (based on the influence track) are always added, face up, to the Consortium board. The other ten Voters are dealt, face down, from the Voter deck containing sixteen possible voters. Those ten will remain unknown unless you acquire Marks through the game, via an action on a University tile, a Spell, a Vault item, or a Supporter. Marks allow you to peek at one of the Voters to see what they require. The Mark is then placed on that Voter. For the remainder of the game, you can look at any of the Voters that have your Mark on them. This is a crutch included in the game not only for those with a bad memory, but so that you can see what Voters your opponents have already seen. At the start of the game, players only know 2 of the total possible voters. Of course, you don’t have to peek at any if you are a gambler and are paying attention to what your opponents are doing. Perhaps they looked at a Voter and are now hoarding Gold. You could assume they saw the most Gold Voter… or perhaps they are hoarding gold because they saw the most Treasures Voter and need to start buying Treasure cards like they are going out of style… or perhaps they are simply hoarding gold to mess with you… And this is the brilliance of the design. 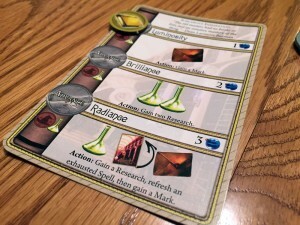 The Voter requirements range from Most of Departmental Control (meaning the most cards and spells known for one of the five schools of Magic, and cards in your discard pile do count towards this amount), Most Resources (Mana or Gold, for example), or Most of a specified card type (Most Consumables, for example). Of course, this is a worker placement game. Honestly, this is one of the most fun designs I have ever played in a worker placement game. Each of the Mages has one of five abilities based on the school they are from (not the school that you are representing). For example, Sorcery Mages can wound an already placed Mage and send it to the infirmary, taking their spot, while Nature Mages cannot be wounded. Then there are Planar Mages that can be placed as a Fast Action, essentially allowing you to place two Mages in the same turn. Each space on a University tile can hold one Mage; however, there are Shadow slots to the left of these spots, allowing a Mage that has been placed using a Shadow effect (generally by Spells, Vault cards, or Supporters), allowing you to use the same action your opponent already claimed. It should be noted that the non-Shadow slot does have priority over the Shadow slot. All University tiles have a powerful slot or slots that require a Merit Badge. Merit Badges are earned at specific increments on the Influence track and can be used once per round once they have been earned. This adds another interesting decision: on which actions should I use my Merit Badges? Also, placing a Mage on an action that requires a Merit Badge may make it a prime target for a Sorcery Mage…. Players must decide if they will purchase more spells, or increase the power of spells they already know. Another great aspect of this game is the large number of Spells in the game. 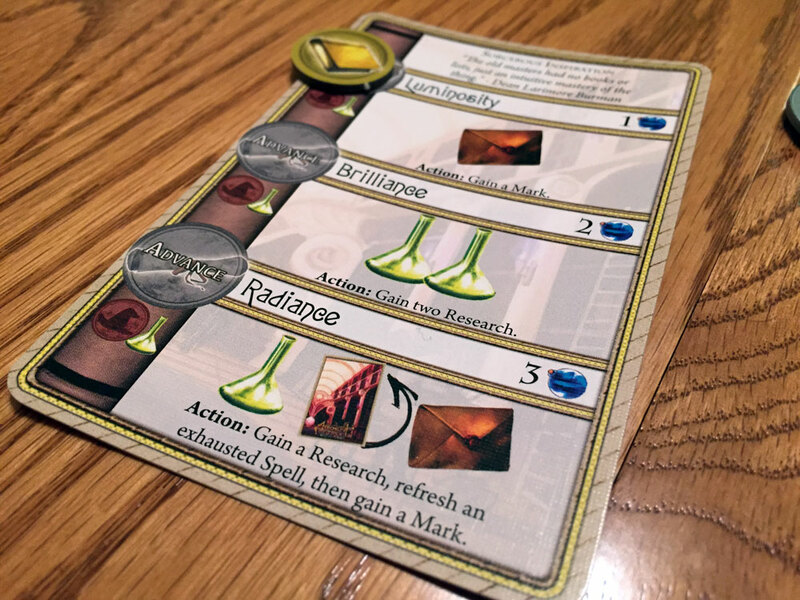 Each Spell is learned through research and spending one Intelligence token. After a spell is learned, the first level of the Spell can be cast for Mana as an action. 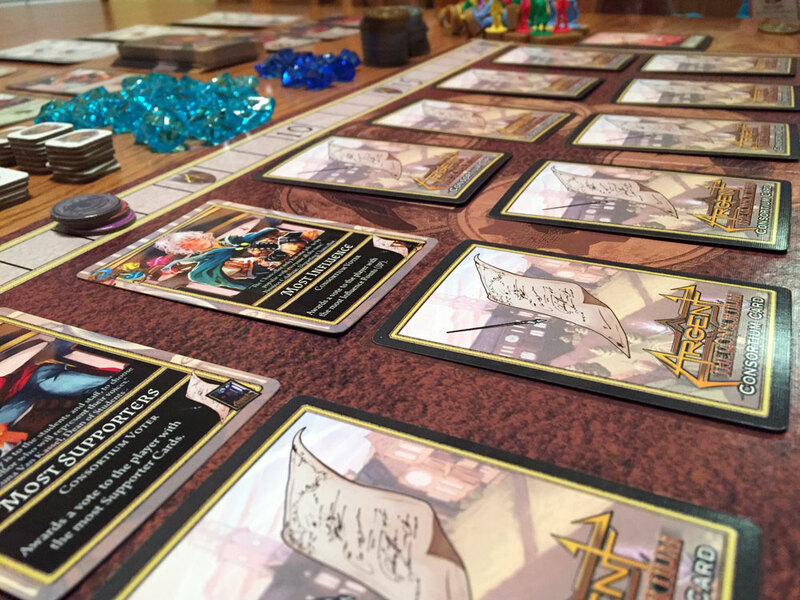 During the course of the game, you will also acquire Wisdom tokens. As part of a research action, a Wisdom token can be spent to unlock the second level of a Spell that you already know. Researching has the following dilemma: do I learn a new Spell or increase the power of a Spell that I already know? 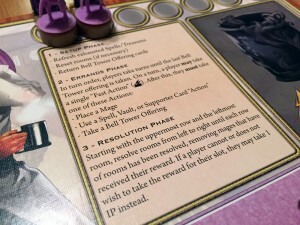 I also love the design decision of having to do your Fast Action first and not at any point of your turn. It may seem like a no-brainer to do a Fast Action every turn, but if you over-commit your Mages by using Planar Mages to place during your Fast Action and then place a Mage using your Regular Action, you may find all of your Mages placed, making it more difficult to react to your opponent’s actions. Finally, there is the mind game that can be played with using your Regular Action to take a Bell Tower Offering card. The number of Bell Tower Offerings is dependent on the number of players in the game. Each card offers something to the player who takes the Bell Tower Offering, from being first player the next round, to providing bonus Gold or Mana or increasing your Influence. All of the Bell Tower Offerings are laid out in a row so you can choose the card that provides the bonus you want from those that remain. Once the last Bell Tower Offering card is taken, the round ends immediately. I really like when games are designed to allow the players to drive the end of the round as it gives you just ONE more thing to be paranoid about. Players can recruit workers from any of the different schools, giving them access to a wide variety of special powers. I LOVED Argent: The Consortium (I warned you…). It is my favorite worker placement game of 2014, and my third favorite game of 2014 (behind Roll for the Galaxy and Imperial Settlers). 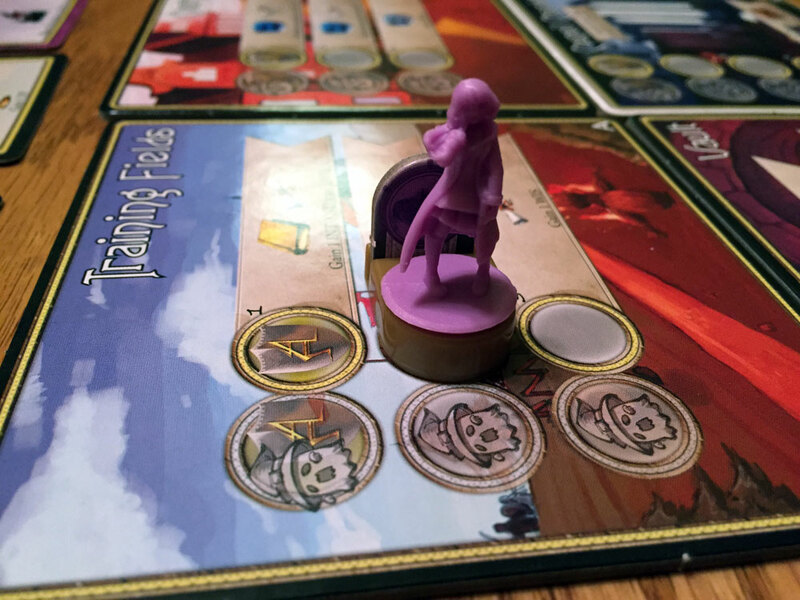 It plays fast (for two to three players), has agonizing decisions, and, while there can be “take that” element to wounding a Mage, the penalties for being wounded are not game ending and, in some circumstance, you may WANT to be injured. Trying to guess who is voting is a blast, as is trying to figure out if your opponent is hoarding gold because the Voter for Most Gold is in play, or if they are trying to save up money to buy a card from the Vault. I highly recommend buying this game, especially if you like worker placement games. The only gamers I would not recommend this game to are people who do not like worker placement games and if you have a very small gaming table. Argent: The Consortium is as fun as it looks, absolutely worth getting. 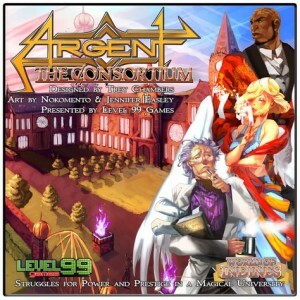 If you are interested in getting a copy of Argent: The Consortium, you can pick it up for about $50. 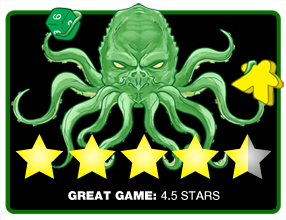 Final Score: 4.5 Stars – A wonderful game with amazing replay value. A must have for any gamer that enjoys the worker placement mechanic. • The art is amazing! • Space hog – if you do not have a large table, playing a 4-5 players may be very difficult.